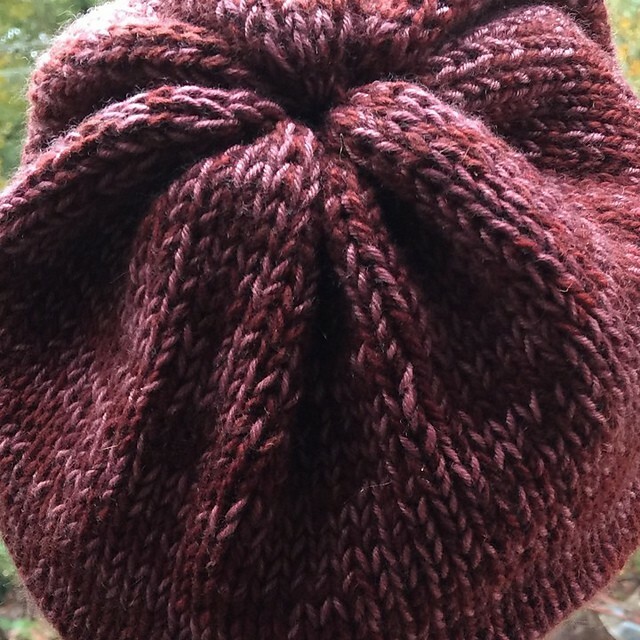 Ever since the Plucky Knitter came out with her Marled Hat pattern — essentially just two strands of different yarns held together for a simple hat — it seems like everyone has been knitting them. My version, knit over a couple of days in New Orleans this week, is making me quite happy. Ellie has stolen it. I'm hoping that's only temporary, but it did give me the opportunity to snap a couple of quick photos. Despite its simplicity, the marled colors make it charming, And, because its finished without decreasing stitches (I actually decreased nine stitches in each of the two final rounds because of the bulk when I tried to finish the hat with the full number still in place) it has a lovely, dimpled crown. The marled fabric is wonderful and the possibilities are endless. Although these two colors are very close, I'm swatching for a sweater with a higher contrast marled fabric, and I like that as well. Best of all, the pattern is free, making this a wonderful quick knit for some pretty skeins in your stash. ← Wednesday: What’s On My Needles?